Hanoi (VNA) – Prime Minister Nguyen Xuan Phuc stated that cooperation with Tokyo Gas Co Ltd is very important as oil and gas cooperation is one of the top priorities in Vietnam-Japan economic ties. 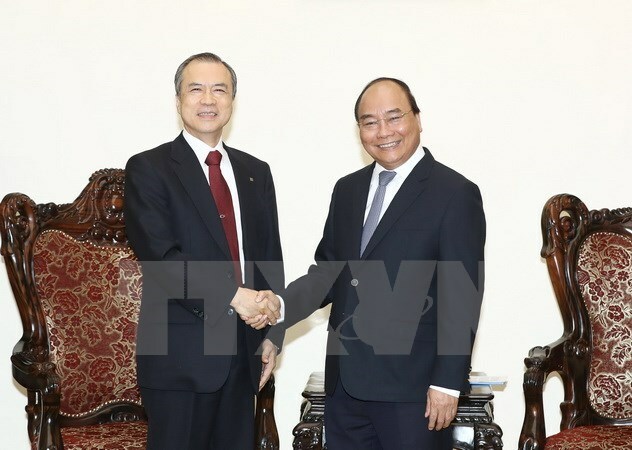 He called on Tokyo Gas to run long-term business in Vietnam during his reception for the company’s President Michiaki Hirose in Hanoi on August 15. The Vietnamese Government always pays attention to and protects legitimate rights of foreign investors, the leader noted. He also highlighted the Vietnamese Government’s views on developing the gas industry comprehensively and effectively by maximizing domestic resources and intensifying international cooperation. He lauded Tokyo Gas’s opening of its representative office in Vietnam and congratulated the company and PetroVietnam Gas Joint Stock Corporation (PV Gas) on the establishment of a liquefied natural gas (LNG) joint venture in Vietnam. Emphasing the huge demand for environmentally friendly LNG in Vietnam and many other countries, PM Phuc expressed his belief that with good partners and favourable business environment, Tokyo Gas will gain successes in Vietnam. He suggested Tokyo Gas have working sessions with PV Gas and the Vietnamese Ministry of Industry and Trade if the company encounters any difficulty while investing in LNG, especially the Thi Vai LNG warehouse project in Cai Mep Industrial Zone in the southern province of Ba Ria-Vung Tau. In reply, Michiaki Hirose said both Vietnam and Japan have conditions to develop the LNG market. Vietnam is an important partner of Japan, covering the field of LNG, he said, adding that Tokyo Gas will step up cooperation with PV Gas in the time ahead. Michiaki Hirose said he believes that Thi Vai LNG warehouse will become the most modern facility in this sector in Vietnam.